(Est. 1919) “Pepto-Bismol® is the only leading brand of medicine that relieves five stomach problems. Available in liquid form, chewable tablets, and caplets, Pepto-Bismol provides relief for heartburn, nausea, indigestion, upset stomach, and diarrhea. 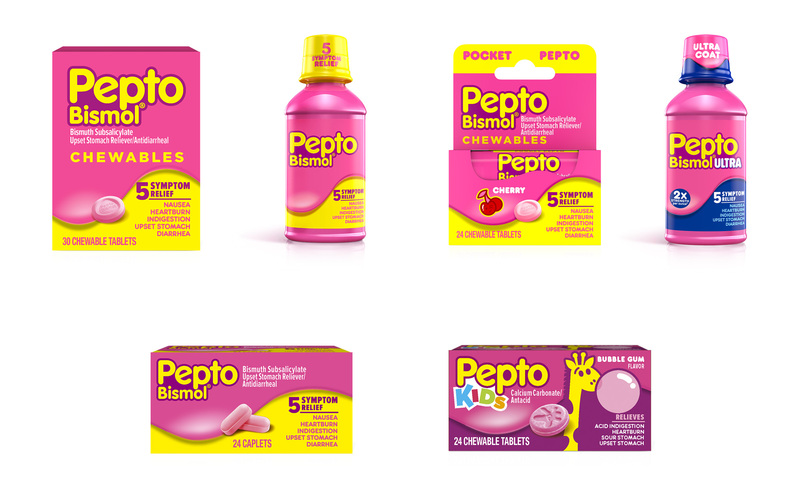 No matter what your belly woes, Pepto has you covered.” Pepto-Bismol is a Procter & Gamble brand. Ad with the new look. It looks like I missed a redesign somewhere between 2009 and now so you will have to excuse me for my lack of attention to one of the weirdest medical products on the market. The 2009 logo I reviewed was a-bismol (ha!) so it was a good thing that they changed at some point to a generic, mainstream, medicine/laundry-detergent swoosh-with-angled-typography aesthetic that at least looked not gross. The new logo is a return to simpler times — check out these vintage bottles — with a straightforward rounded sans serif font. It’s not exciting by any means but it’s… restrained. The addition of purple to the pink and yellow palette is good. The new packaging is still a little gross with the dripping goo on the label but it seems the goo inside has gotten a burst of color and now comes in more of a hot pink variation matched by the label. 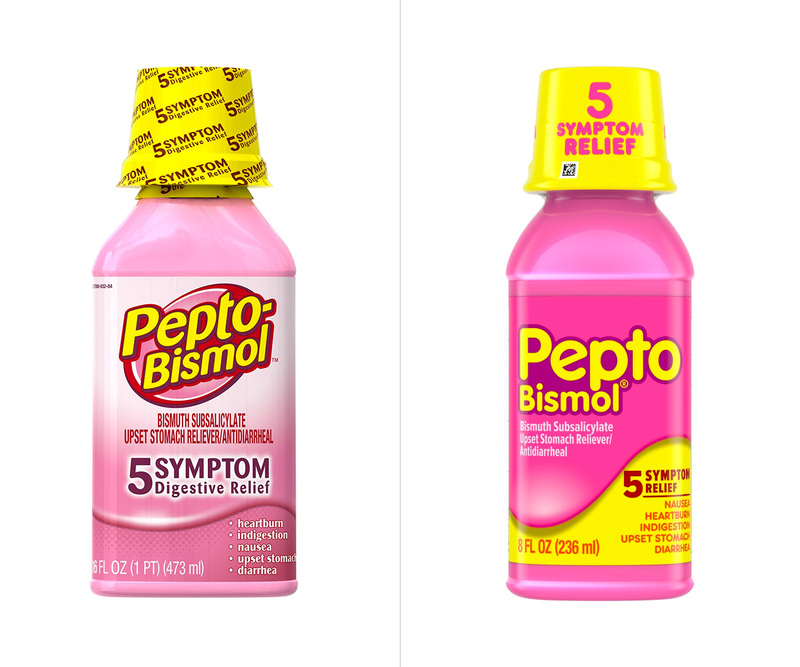 This is way more than I ever thought I would be writing about Pepto-Bismol and I’m surprised to write that this is not all bad, considering how mainstream this product is. The “5 Symptom Relief” yellow cap is, dare I say it, kinda cool and that jacket in the ad… yeah, I wouldn’t mind a sample of it to keep in my archives of design stuff, even if it’s ironically. I know this isn’t high-end design nor conceptually interesting but within the context of the Pepto-Bismol world this is substantially good — relatively speaking. Thanks to Sarah Gardener for the tip. (Est. 1919) \"Pepto-Bismol® is the only leading brand of medicine that relieves five stomach problems. Available in liquid form, chewable tablets, and caplets, Pepto-Bismol provides relief for heartburn, nausea, indigestion, upset stomach, and diarrhea. No matter what your belly woes, Pepto has you covered.\" Pepto-Bismol is a Procter & Gamble brand.